Bring four to seven modular pouches or lens changers, related accessories, an up to 17" laptop, tablet, and personal items on your next photo adventure with the black Naked Shape Shifter 17 V2.0 Backpack from Think Tank. The Shape Shifter gets its name from the ability to save space by compressing to a depth of only 3" when empty. 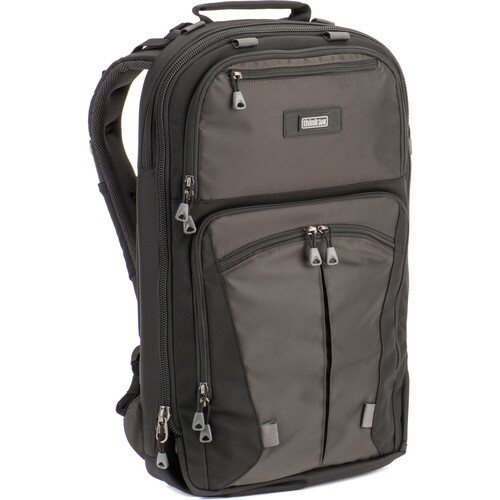 The pack features separate laptop and tablet compartments, and a spacious, zippered main compartment with attachment points for storing and organizing modular Think Tank pouches and lens changers, purchased separately, On the front exterior of the pack is a pocket for the base of a small tripod, and adjustable straps to secure the upper and lower sections. Additional storage is provided by exterior pockets, organizer panel, and a plush pocket for a cell phone with an up to 5.5" display. Carry your Shape Shifter by the top handle, or wear with the curved, padded, adjustable shoulder pads, sternum strap, and removable waist belt. Photographers will appreciate the two stretch pockets on the shoulder straps for storing sunglasses and other small items that require handy access. On the rear of the pack is a roller handle pass-through sleeve. Stay hydrated with the included water bottle pouch. And keep your gear dry with the included rain cover. For strength, durability, and weather protection, the pack is constructed with water-repellent fabric coated on the underside with polyurethane. Easily accessible plush pocket fits smartphones with displays up to 5.5"
Box Dimensions (LxWxH) 21.4 x 17.9 x 6.7"
Naked Shape Shifter 17 V2.0 Backpack (Black) is rated 5.0 out of 5 by 2. Rated 5 out of 5 by Caesari from Very convenient if you have the belt pouches I have the lens and accessories pouches for the belt system, so this back pack is very convenient to transport in a trip or airport your gear and then at the destination, assembly the belt system. Very roomy and strong. Rated 5 out of 5 by Charles Denis from Best bag at life , small, convenient, and I can configure at my taste for the kind of expedition.